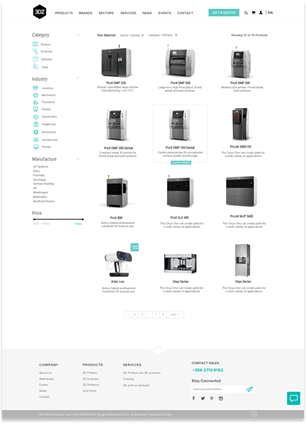 3DZ is a well established Italian company based in Malta selling 3D printers and services. We collaborated with them on a full rebrand and the development of their e-commerce site. We made the bold decision to switch from black to white to emphasize the modern, innovative tech 3DZ represent. We added an image carousel to spotlight their printers in a wide variety of uses. To emphasize the strong growth 3DZ is powering, we added a map of their global reach and made the site multilingual. We built individual pages for every product in their catalogue and made sure that bold design comes through on every one. Extremely proud to start 2018 with such an amazing project.